← Press Coverage by The Armenian Weekly and The Armenian Mirror-Spectator! 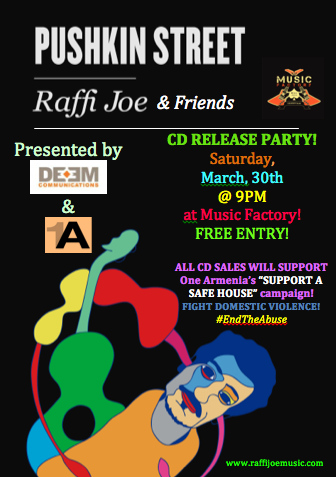 CD Release Party to Fight Domestic Violence in Armenia! CD RELEASE PARTY! Saturday, March 30th, 9pm at Music Factory in Yerevan, Armenia! FREE ENTRY, and 100% of CD Sales donated to ONEArmenia’s “Support A Safe House” campaign, an initiative to support the funding of one of Armenia’s only battered women’s shelters.